The ANS-6 Bat Box is a bat box that is suitable as a summer residence and can be installed in facades of buildings, such as the outer walls of a house or business premises. This bat box can also be mounted under wooden paneling. The access to the two inner spaces of the ANS-6 Bat Box is formed by two slots. The two inner compartments are separated by a wall. Due to the sloping entrance openings, droppings can fall out and this cabinet is maintenance-free. 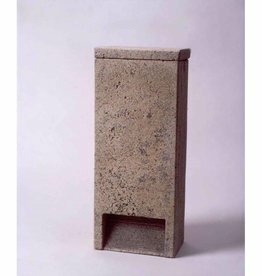 The ANS-6 Bat Box is made of wood concrete, known for its sustainable and ecological advantages. The rough surface on the inside ensures that bats have good grip and can move freely in the ANS-6 Bat Box. This bat box is also characterized by a low heat loss so that there is a microclimate that is ideal for bats. The ANS-6 Bat Box is similar to the 1FR from Schwegler and is a good alternative for this.